Cricket Australia showed the rest of the world that ball-tampering – aka cheating – has no place in the sport by banning Steve Smith and David Warner for 12 months and Cameron Bancroft for nine. Cricket Australia can show the same leadership for the kids of today and the internationals of tomorrow by banning the trick shots of reverse sweeping, ramping and paddling. Ask any kid who their heroes are and a large percentage rate Glenn Maxwell at the top because he likes to play the ‘exciting’ reverse sweep and he’s a great fieldsman. And it doesn’t help when Adam Gilchrist, one of the most devastating strikers of the ball in the history of cricket, has Maxwell in front of the Fox Sports cameras praising his massive reverse sweep six at Bellerive on Christmas Eve that travelled 83 metres for the Melbourne Stars against the Hobart Hurricanes. Kids will always follow their heroes, even though most of them find it hard enough to lift the bat, let alone play harder shots than the norm. Like the Wallabies must vastly improve their grip on rugby basics if they are to get back into the winning habit, kids must be taught the normal and accepted batting techniques if they are to become internationals. Australia’s most successful Test batsmen of all-time – Sir Donald Bradman, Ricky Ponting, Steve Waugh and Allan Border – never played a reverse sweep, a ramp or a paddle in their entire careers, but they sure concentrated on their techniques to become champions. I bet Jos Buttler and Moises Henriques have seen replays of their most recent Big Bash dismissals and shuddered at their stupidity. Both were cruising in their 50s having played every ball on its merits in quick time – until they had brain fades. 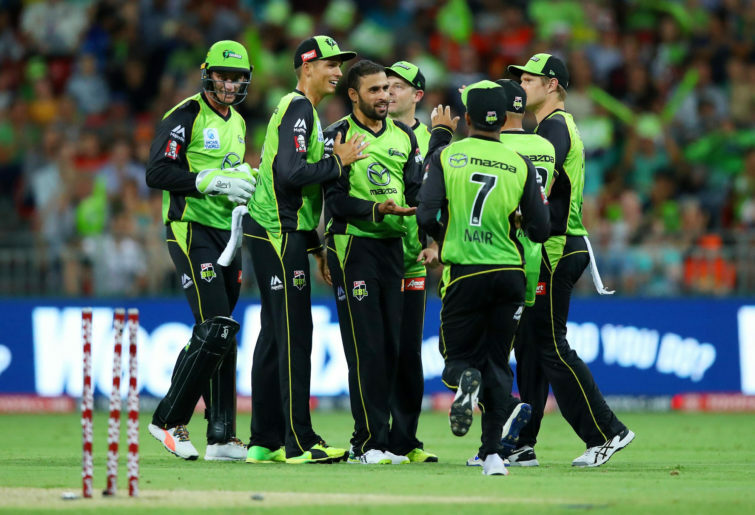 Buttler, a highly-intelligent cricketer and vice-captain of England, was on 55 for the Sydney Thunder in even time on a very difficult wicket when he suddenly decided to reverse sweep, totally out of character. He overbalanced to a slower ball from Scorcher paceman Jhye Richardson and, trying to compensate to catch up with the delivery, cleaned out his castle and departed hit wicket. Fortunately for Buttler, the Thunder won by one run, but they should have been so far in front that the Scorchers wouldn’t have stood a chance. Henriques has suffered a couple of lean seasons, but this year he’s back to his best as captain of the Sydney Sixers – but he won’t forgive himself for his ramping attempt. He was travelling smoothly on 20 in even time when he had his brain fade. Facing Jack Wildermuth, Henriques dropped his hands, leaned back and helped his ramp into his leg stump instead of over the keeper’s head. He left the field shaking his head, as he should. The Sixers won by 33, no thanks to their irresponsible skipper – it was largely due to 21-year-old offie Ben Manenti on debut not only capturing 2-13 off his four but also claiming man of the match as well. But Glenn Maxwell is the perfect example late in his career of where Cricket Australia can make him one of the world’s best by banning all trick shots. Matthew Wade did Maxwell no favours by originally tabbing him the ‘Big Show’ – who became the No Show with a series of wipe-outs. I’ve already written it’s time for Maxwell to realise his God-given natural talent, and that can be achieved overnight by Cricket Australia banning all trick shots from the juniors up. Instead of Maxwell always thinking, ‘How can I entertain by playing trick shots?’, by concentrating on the basics with all his wonderful talent and power he will still entertain – but more importantly he will play a very serious role in Australia’s cricket revival in all formats. Glenn Maxwell on fire is on one the great sights cricket can provide. Minus the trick shots, the firing will be far more regular.